The July/August 2010 issue of IEEE Software features an article entitled “Monitoring Software Quality Evolution for Defects” by Hongyu Zhang and Sunghun Kim. The article is of interest to the software developer/tester/manager in quite a few ways. In particular, the authors report on their successful use of 3σ control limits in c-charts used to plot defects in software projects. One to one-and-a-half standard deviation better than the mean might not seem like much to six-sigma black belts. However, in the context of typical results we see in the software industry the QSI results are outstanding. I have not done the exact math whether those results are superior to 95%, 97% or 98% of software projects in Michael Mah‘s QSMA database as the very exact figure almost does not matter when you achieve this level of excellence. Another way of looking at six-sigma in a software context would be to achieve a defect-removal efficiency level of about 99.9999 percent. Since the average defect-removal efficiency level in the United States is only about 85 percent, and less than one project in 1000 has ever topped 98 percent, it can be seen that actual six-sigma results are beyond the current state of the art. The setting of control limits is, of course, quite a different thing from the actual defect-removal efficiency numbers reported by Jones for the US and the very low number of defects reported by Mah for QSI. Having said that, driving a continuous improvement process through using 3σ control limits is the best recipe toward eventually reaching six-sigma results. 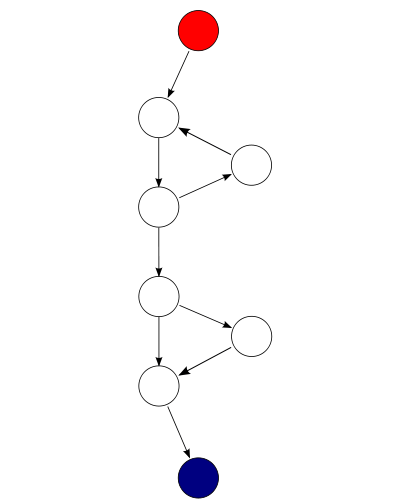 For example, one could drive the development process by using Cyclomatic complexity per Java class as the quality characteristic in the figure at the top of this post. In this figure, a Cyclomatic complexity reading higher than 10.860 (the Upper Control Limit) will indicate a need to “stop the line” and attend to reducing complexity before resuming work on functions and features. 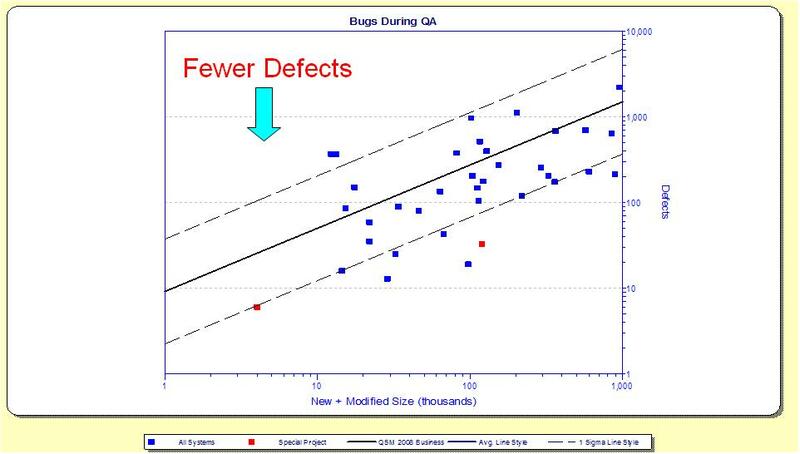 Quality control charts, especially c-charts, can help monitor software quality evolution for defects over time. c-charts of the Eclipse and Gnome systems showed that for systems experiencing active maintenance and updates, quality evolution is complicated and dynamic. The authors identify six quality evolution patterns and describe their implications. Quality assurance teams can use c-charts and patterns to monitor quality evolution and prioritize their efforts. Colleague and friend Michael Mah has kindly shared with me the figure above – quality assessment for a sample of Agile projects in the QSMA metrics database of more than 8000 software projects. The two red squares in this figure represent the recent results Mah measured on two projects carried out by Quick Solutions (QSI) – a Westerville, OH company offering a broad range IT services. One to one-and-a-half standard deviation better than the mean might not seem like much to six sigma black belts. However, in the context of typical results we see in the software industry the QSI results are outstanding. I have not done the exact math whether those results are superior to 95%, 97% or 98% of software projects in the QSMA database as the very exact figure almost does not matter when you achieve this level of excellence. For the projects referenced in Michael’s evaluation, our primary focus was quality… Our team was tasked with not only a significant Innovation effort, but we also managed all aspects of supporting and stabilizing the application (production support, triage, infrastructure, database support, etc.). Our ‘secret sauce’ was assembling a world class team and executing our Agile methodology. We organized the team efforts to focus on the three major initiatives; Innovation, Stabilization (Technical Debt), and Production Support. We developed a release plan and coordinated efforts to deploy releases that resolved a significant number of defects, introduced market differentiating features, and addressed massive amount of technical debt. The team was able to accomplish this without introducing additional defects into the production system. Our success can be attributed to the commitment from the business to understand our Agile methodology and being highly engaged throughout the project (co-located with the team). In addition, the focus of quality that is integrated into our process through the use of Test Driven Development, Continuous Integration, Test Automation, Quality Assurance, and Show & Tells. Lastly, this would not have been possible without the co-location of the entire team given the significant issues and time constraints for delivery. Bart also provided me with a table ‘a la Capers Jones’ in which he elaborates on the factors that helped QSI achieve these results and those that stood in the way. I will publish and discuss Bart’s table in a forthcoming post. As part of this post I will also compare the factors identified by Bart with those reported by Capers Jones. Should You Ship This Code Before Reducing Technical Debt?! Shipping first time code is like going into debt. A little debt speeds development so long as it is paid back promptly with a rewrite… I thought that rushing software out the door to get some experience with it was a good idea, but that of course, you would eventually go back and as you learned things about that software you would repay that loan by refactoring the program to reflect your experience as you acquired it. Should I ship this code before reducing the accrued technical debt?! The Figure below, taken from An Objective Measure of Code Quality by Mark Dixon, answers the question with respect to one important component of technical debt – cyclomatic complexity. Once complexity per source code file exceeds 74, the file is for most practical purposes guaranteed to contain errors. Some of the errors in such a file might be trivial. However, a 2007 study by Capers Jones indicates about a third of the errors found in released code are likely to be serious enough to stop an application from running or create erroneous outputs. The economics of defect removal clearly favor early defect removal over late defect removal. The cost of removal grows exponentially as function of time. Brand risk should be first and foremost on your mind. If complexity figures higher than 74 per file are more of the norm than the exception, you are quite likely to tarnish your image due to poor quality. If you decide to postpone the release date until the technical debt has been reduced, you can apply yourself to technical debt reduction in a biggest-bang-for-the-buck manner. The analysis of complexity can identify the hot spots in your code, giving you a de-facto roadmap you would be wise to follow. Conversely, if you opt to ship the code without reducing technical debt, you might lose this degree of freedom to prioritize your “fix it” work. Customer situations and pressures might force you to attend to fixing modules that do not necessarily provide as much bang for the buck. Postscript: Please note that the discussion in this post is strictly limited to intrinsic quality. It does not address at all extrinsic quality. In other words, reducing/eliminating technical debt does not guarantee that the customer will find the code valuable. I would suggest reading Beyond Scope, Schedule and Cost: Measuring Agile Performance in the Cutter Blog for a more detailed analysis of the distinction between the two. Erratum: The figure above is actually taken from a blog post on the Mark Dixon paper cited in my post. See McCabe Cyclomatic Complexity: the proof is in the pudding. My apology for the error.